Our eyes are often sensitive to environmental influences, e.g. draft, extreme dryness of the surrounding air, sleep deprivation and also chlorinated water in public swimming pools can be the cause of conjunctivitis. Reddening of the usually white parts of the ocular surface is an unmistakable sign for inflammation. This reddening is due to an expansion of the blood vessels which traverse the conjunctiva. The reddening is often accompanied by unpleasant itching and watery eyes. 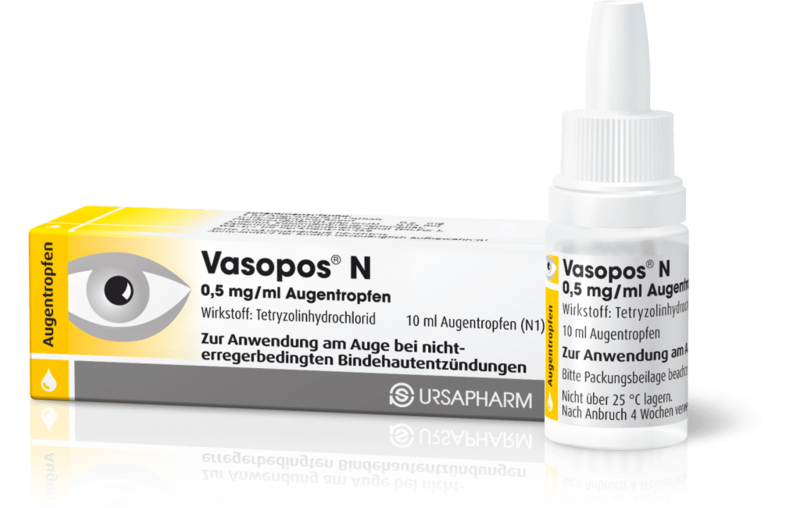 The active ingredient tetryzoline contained in Vasopos® N quickly leads to a contraction of the expanded blood vessels in the reddened conjunctiva. This is accomplished by the fact that tertyzoline attaches to certain receptors of the autonomic nervous system, localized in the conjunctiva, which trigger such a contraction of the blood vessels. The unattractive reddening of the eyes recedes and the conjunctiva regains its clear white color. This is also associated with an alleviation of the unpleasant itching sensation.